The suit jacket! This complex garment and its brothers, the sport coat and blazer, have stood the test of time in menswear. For hundreds of years, men have been wearing this garment to perform business, sports, and to show up to functions of all sorts. There is a saying that “the suit makes the man.” Maybe you have marveled at this item. How could one complex item define menswear for so long? Inside we explore all the components that may or might be found on a sport coat or suit jacket. Maybe you purchase your jackets off the rack at your favorite retailer. Maybe you travel the world and want to visit an Italian or English tailor. This book will teach you the knowledge of what to look for and ask for. It removes the mask of secrecy and opens up the sartorial world for your enjoyment. In this book I have purposely tried to avoid the cliché knowledge that we will assume you already know. Such as; which button to button, and which to leave undone. Always the middle and never the bottom…incase you have not got that one yet. Here we get much more in-depth, but not so much that you get lost. The perspective offered is unfettered with a stylist's point of view. It is factual and visual with illustrations and photographs breaking down each detail. Secrets of Suits & Sport Coats - a guide to understanding men’s suits and sport coats. 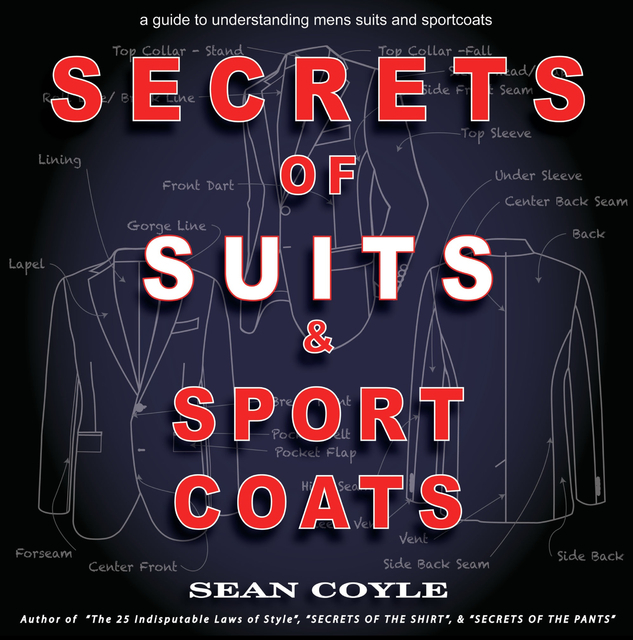 This book shares inside industry knowledge about the design and style of men’s suit jackets. It is packed with tips and guides on understanding the differences between suits, suit separates, blazers, and sport coats. There are elaborate illustrations guiding you to get the most from your jacket from fit to fabrics.